No longer is workplace volunteering viewed as desirable – Canadian employees are demanding it. A 2017 report from Volunteer Canada shows that 87% of Canadians believe volunteering is vital for social and economic well-being. This explains why 68% of Canadians would choose a job that has a strong volunteer culture over one that does not. Companies that have an employee volunteer program give themselves a competitive edge when attracting and retaining talent. We all know what it’s like to receive bad customer service from an employee that is unengaged. It’s not likely you will go back to that company again. Having engaged employees are crucial to your success as a business. Engaged employees are passionate, committed and loyal to your company. According to a 2019 study by Gallup, businesses with highly engaged employees have a 41% reduction in absent employees and a 17% increase in productivity. Additionally, they achieve a 10% increase in customer ratings and a 20% increase in sales. With employees being more productive and more engaged with the customer experience, profits increase by 21%. businesses with highly engaged employees have a 41% reduction in absent employees and a 17% increase in productivity. Encouraging volunteerism in your workplace expands your business’ visibility in a way paid advertising can’t. Loyal employees’ become ambassadors for your brand, spreading news through their individual networks about the good you’re doing. Additionally, the organizations you support through volunteering recognize your efforts and also provide a channel for positive brand awareness. With 78% of consumers agreeing that businesses should be accountable to improving the economic and social conditions of their communities, encouraging employee volunteerism also means attracting loyal consumers who will spread the news of your generosity through their personal networks. Employees that volunteer are employees that are happier in the workplace. According to Harvard Health Publishing, volunteering has numerous wellness benefits such as improved mental health and a decrease in stress. Having an employee volunteer program means that you are engaged with the personal values of your employees – caring more about their wholeness and wellness instead of caring solely about the hard skills they bring to the workplace. Additionally, empowering employees to volunteer provides an opportunity for them to boost social skills such as leadership and communication. 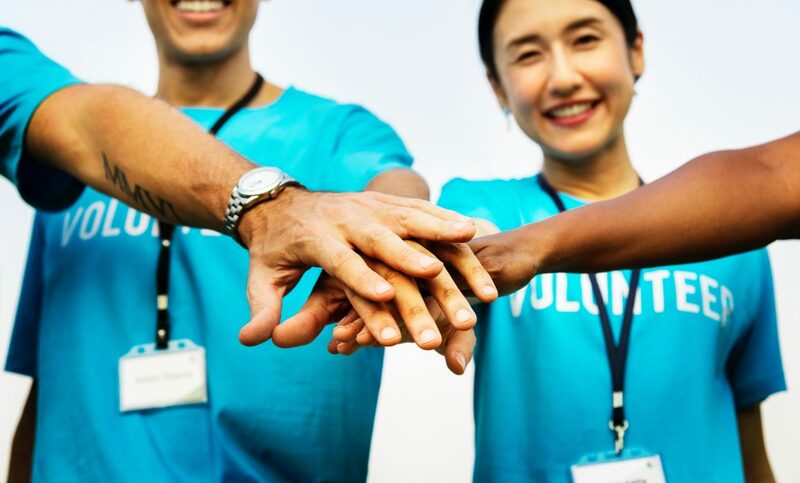 A study from Corporate Citizenship in the UK found that volunteering pushed their employees outside their personal comfort zone, enabling them to develop new skills that transferred easily back to their jobs. Volunteering is vital to both the social and economic well-being of Canadian communities. Although volunteers are unpaid, they contribute greatly to the Canadian economy through the value of services provided. Volunteer Canada estimates that volunteers added over two billion hours to Canada’s work effort in 2017. Volunteerism works to make Canadian communities vibrant, inclusive and connected. It supports hospitals, universities and research centers to make key advancements in science and medicine. It helps individual Canadians in need. It supports service organizations, shelters and food banks. Finally, volunteering contributes to the arts, culture, environment and sports in Canada. 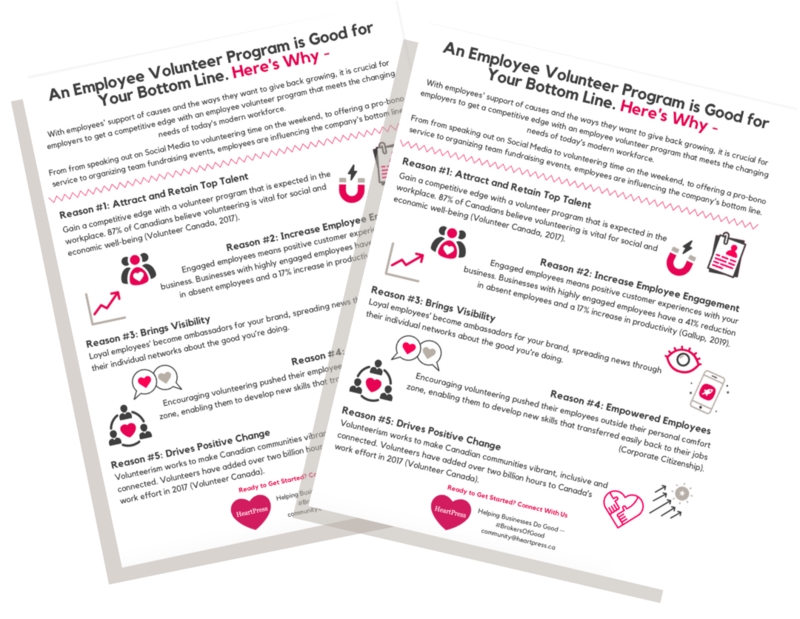 Download our Top 5 Reasons An Employee Volunteer Program is Good for Your Bottom Line to learn how to get a competitive edge over the competition.